Manufacturer of a wide range of products which include fep/pfa lined butterfly valve, lined butterfly valves and fep & pfa lined butterfly valves. With our dedication to serve our customers in the best possible manner, we have brought forward impeccable designed Lined Butterfly Valves for our treasured customers. 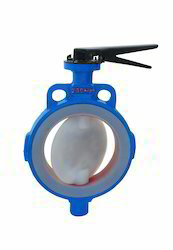 With high-grade materials and sophisticated technology incorporated in their manufacture, these valves are much regarded for their longer functional life and exceptional performance in flow regulation. Customers are reasonably charged for these valves. Body Seat (Sleeve) I Lining: FEP/PFA 50mm to 200mm above 200mm PTFE. Flapper Lining Material: FEP/PFA. Lining Thickness: – 3 to 5 mm THK. 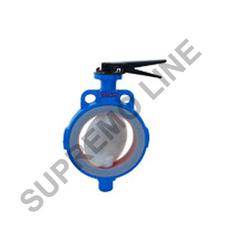 Leveraging our rich experience in this industry, we are engaged in proffering PTFE Lined Butterfly Valves to our priceless patrons. These valves comprise of a section pipe and lead to a pressure drop in the flow. Characterized by high arc resistance, exceptional elongation and exceptional folding endurance, these valves are highly demanded by the customers.